May | 2008 | tasty treats! 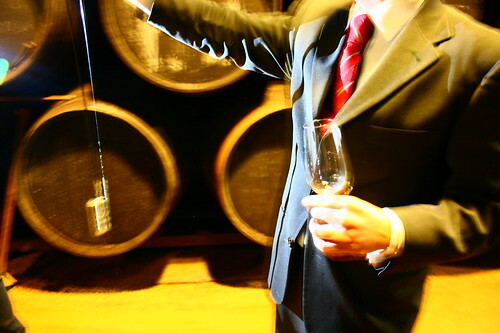 We arrived yesterday (Tuesday 29th) and got straight into sherry tasting, in the Bodega Sánchez Romate. As someone who had never drunk a drop of sherry in her life, the experience was an enlightening one, and I think I’ve become a convert! 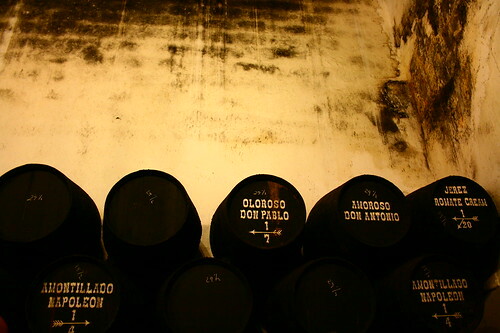 The cool, dark bodegas are stacked with thousands of barrels of sherry by the solera system (where barrels are stacked in rows at least three barrels high, with the oldest blend of sherry at the bottom, the suelo, followed by the younger barrels on the upper layers, the criaderas). I won’t bore you with the details, though it certainly is interesting how the quality of the sherries are kept consistent by constantly topping up each layer with the sherry from the layer above it, each time an amount (a third) is drained from the bottom barrel. It’s fascinating how the wide the spectrum of sherry varieties spans – from light, crisp and dry fino (one of the more commonly known sherry types in the UK, alongside Harvey’s Bristol Cream) to deep, dark and syrupy Pedro Ximénez. In between, manzinilla (slightly salty, and the drink of choice in the seaside location of Sanlúcar, where we went on our last day), amontillado, oloroso (the last of which was very much a favourite among the group, thanks to its smoothness and nuttiness!). Then there’s the very special, and very rare palo cortado, which has the freshness of an amontillado, but the smoothness and richness of an oloroso. 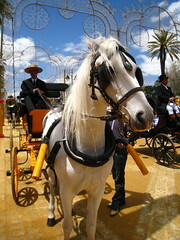 We were very lucky because at this time of year the region plays host to the Feria del Caballos, a week-long festival celebrating three of Jerez’s best known elements – sherry, horses, and flamenco. 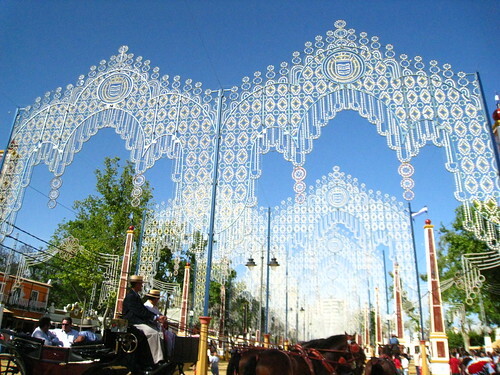 Held in a massive fairground a few kilometres from the town centre, the Parque Gonzalez Hontori on Avenida Alcalde Alvaro Domeque, people flock from all around Jerez (and from neighbouring regions as well, as Jerez’s feria is known to be one of the best, while there are also ferias held in Seville and El Puerto) to eat, drink and be merry. Beautiful Andalucían white horses parade throughout the streets and into the grounds, pulling elegant black carriages carrying equally regal-looking men and women (many of them in colourful Sevilla flamenco dresses). There really are no two Sevilla dresses alike in this town – the saying goes that you can know a woman from the kind of dress she wears. 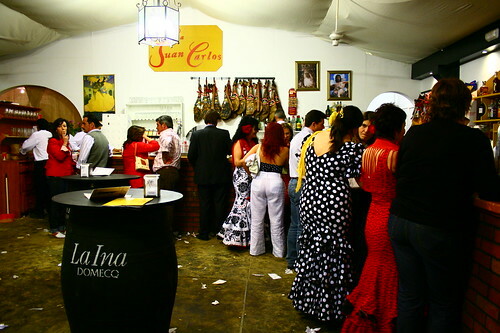 Many of Jerez’s restaurants, bars and clubs set up as casetas (stands/booths or tents – some of them with proper facades!) and basically we just flitted from caseta to caseta, indulging in tapas and sherry. In the afternoon, we were lucky enough to be taken under the wing of the Romate company and we wiled away the hours eating delicious nibbles in the shade, watching the colourful people and horses of Jerez waltz by. We also discovered the joy of rebujitos (a popular refreshing cocktail of dry fino mixed with lemonade), which quickly became a tipple of choice under the hot Spanish sun, when even dry sherry seems too heavy. 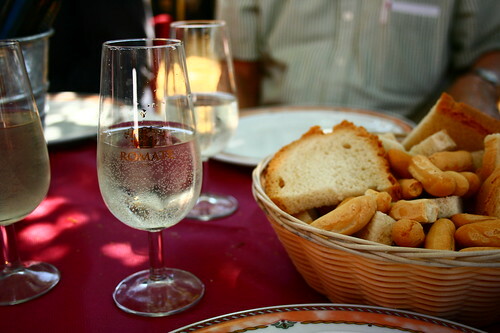 If they introduce this in the UK, perhaps sherry drinking would become more acceptable. I thought I spotted rebujito being served at Barrafina the other night, but when I asked was met by a curt “no” (on a side note, Barrafina’s service seems to be getting arsier these days). 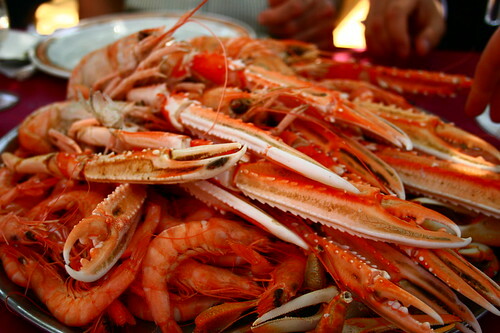 The first thing to arrive on the table was a heaving platter of fresh seafood – crab legs, prawns, langoustines, crayfish, and small crab claws. Salty as the sea and juicy and fresh to boot. I honestly was in heaven. And what is a trip to Spain but a chance to indulge in the country’s best exports? I’m not sure if the above constitutes as a tortilla or not, since it was a bit… deconstructed, with the eggs and potatoes seemingly just scrambled together – someone needs to enlighten me on this. 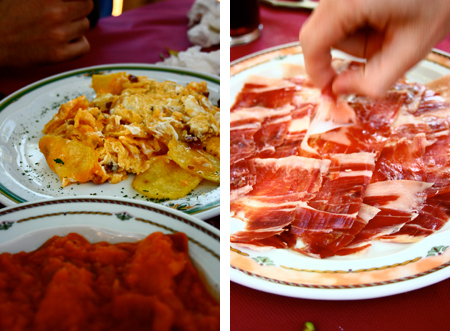 And of course, there was a big plate of Jamón Ibérico – my personal favourite, as a fan of all cured hams! I have to say, the nuttiness of jamón matches perfectly with dry sherry. 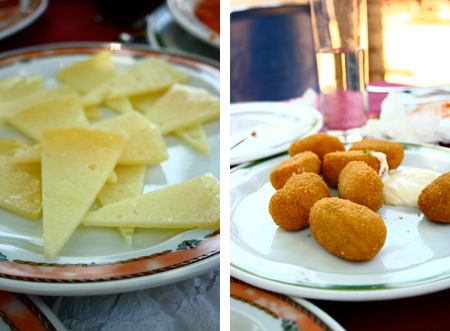 And of course, there was the ubiquitous manchego cheese and crunchy-outside, gooey-inside croquetas de jamón. After a long afternoon of eating and drinking, we soon headed back to the hotel for a power nap to recharge ourselves for the night at the feria (more eating and drinking! ), which brings me to the end of this entry (and when I originally started writing it)!